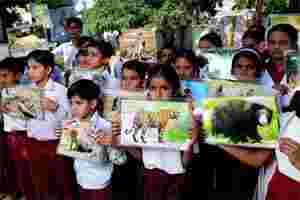 The students of Tiwari Bal Niketan at Kundera village in Rajasthan’s Sawai Madhopur district can rattle off the gestation periods and expected life spans of 30-odd animals. They can also identify pugmarks and calls from the wild. But the questions that get all of them to raise their hands during an environment quiz are: What is the state animal of Rajasthan? What is the national animal of India? “Chinkara! …Tiger, tiger, tiger!" Tiger conservationist Valmik Thapar set up the foundation as a non-profit non-governmental organization (NGO) in 1987 with an aim to “integrate locals with the greater cause of protecting the tiger and its ecosystem". While healthcare was the entry point into the tribal communities that lived inside or just outside the area now designated as the national park, its primary focus is environmental education now. Their evangelist is Hanuman Prasad Sharma, a poet who works as the coordinator of the foundation’s education projects. Sharma joined the foundation in 1992 and goes around village schools conducting weekly classes. The foundation’s project currently affects around 8,000 children in 20 schools across 40 villages in the district. Sharma, or “Masterji", has his own curriculum, a 96-page book called Hamaara Paryavaran Evam Vanya Jeevan (Our Environment And The Wildlife). “We teach children about the riches of the forest early on. Working with the people is important because deforestation is one of the greatest dangers that the tiger faces today," says Sharma. “The children grow up to be responsible citizens. And they shame their parents out of going into the forest for firewood." Sharma uses songs, rhyme and even skits to get his message across in Hindi and Dhundhadi—the dialect of Rajasthani spoken in Sawai Madhopur. Because of a paucity of funds, every child doesn’t have a copy of the book; they take turns to share the few their schools have been given. The foundation conducts an annual exam in October across schools. Three students who top the exams in each age group are given scholarships that range from ₹ 500-1,000 a month. “Given that there aren’t any other awards or scholarships around, the Ranthambore Foundation scholarship is really sought after. That’s why they’re fighting for that book all the time," says Jagdish Prasad Sharma, the principal of Tiwari Bal Niketan, smiling. Apart from the exam, Sharma also oversees elocution competitions, nature rallies and nature clubs for the village children—all of which have had a seemingly deep impact. Bharti Gautam, a 13-year-old class IX student who received a scholarship from the foundation last year, says she wants to be a veterinarian. The Ranthambore School of Art is another one of the foundation’s efforts at income generation. With its studio right at Sawai Madhopur’s tourist hub, the artists who create oil, watercolour and charcoal paintings there receive between ₹ 2,000-4,000 for each artwork sold. In November, with new funding from the Royal Bank of Scotland (RBS), the school will be conducting free professional training classes for the youth. Narayan Singh, the artist who runs the school independently now, was himself a beneficiary of the foundation’s work and joined as a student in 1992. “We’re looking at preparing at least 40 artists over the next two years," he says. “We want to some day have our own exhibition space and gallery." With the new funding, the foundation hopes to expand its activities with the arts and crafts outfit Dastkar, anti-poaching training and capacity building at the Ranthambore School of Art. In 2000, Thapar withdrew from the foundation’s work because of his disenchantment with state politics and the failure to get different factions united in a singular effort. “We need a completely new model to save the Indian tiger. The government needs to make this a special project," he says. “There needs to be better coordination with the government of India, the state and other NGOs to promote and support field activities." Meanwhile, things are changing slowly for the people of Sawai Madhopur. Every restaurant or dhaba you go to will have a tiger poster. And when you turn the menu card, the message is always the same: Save the tiger.